The 1955 model year brought few changes over the 1954 Ford trucks. The grille was changed. It now had a dip in the middle on the top bar (which designated a 6 or 8 cylinder engine: a star for 6-cylinder engines, a V8 emblem for 8-cylinder engines). 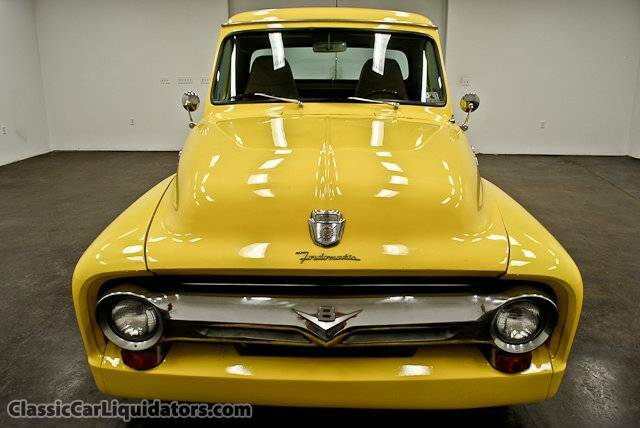 The vertical guards were gone, and the Ford F-100 emblem on the sides of the hood was "fancier". Other changes include optional power brakes and tubeless tires were put on the F-100 model. We found this video on YouTube and thought we'd share it, what an amazing '55! A custom cab option was available on the F-100 which added 17 amenities, including foam rubber cushions, color-keyed two-tone upholstery, armrests, dual horns, light gray sun visors, side bolsters, kick and door panels, headliner, and sound deadener. Custom Cab trucks also came with chrome Custom Cab door emblems. All photos shown on this page are used with permission by Classic Car Liquidators.